While I don’t know trendy designer labels or what’s the “it” handbag of the season, I know how to look fantastic with ageless style on a modest budget. 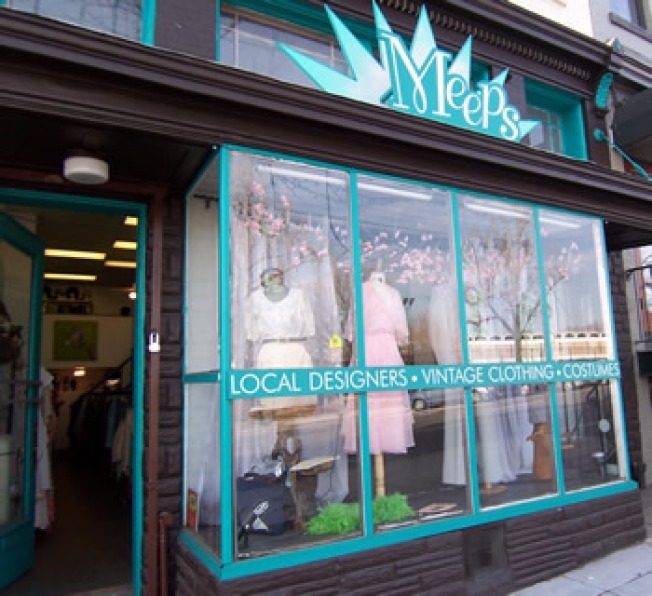 In D.C., your great look for less can be found at Meeps Vintage Fashionette in Adams Morgan. With wares like a 60s cream, clasped tote ($15) to compliment a gold sequined sweater ($28), Meeps meets your budget-friendly fashion needs. In its new home on 18th Street in Adams Morgan, Meeps expanded its fitting rooms and shined more light on its offerings: men’s and women’s tops and bottoms, leather jackets, shoes, bags, and more. Aisles of vintage stock fill the center of the store with local designers’ reworked vintage or new styles along the front wall. On the third Thursday of each month, Meeps joins other local retailers in the Mid-City Shoppers Social, offering sale prices and free munchies. Attention to detail and durability of clothes of an earlier era are always in style, even if the vintage store staple, the ubiquitous bell-bottoms, swings in and out of fashion. An A-line dress in purple polyester ($28) can be dressed up with fish-nets, boots, and a cardigan. Bold print shirts ($25) accent the simple Capitol Hill gray suit. Funky sunglasses and creative jewelry are on hand to complete the outfits. A designer called Andy Would Do It remakes vintage textiles into unique skirts ($45). Men’s dress shirts are plentiful and stylish. Ranging in price from $20 to $35, the long-sleeve prints can take a beating in the washing machine. On a recent afternoon of party dress perusal, owner Danni Sharkey pulled a blue and brown 70’s mini-dress from the back closet and said, “I was holding this for you. I think you’ll love it.” She was right. For $28 I walked away with a dress surely no one else in D.C. will be wearing and with a warm feeling that the shop owners are thinking of me. Try to find that at The Gap! Need further reason to shop vintage? Recycling is totally in style right now. From exchanging bottles to buying hybrid automobiles, going green means reducing your footprint on the globe and leaving it better off than when you got here. Vintage clothes are the wearable environmental statement. Want more? Buying vintage means finding great clothes at affordable prices, without worrying that you’re supporting sweatshop labor. Many of Meeps’ offerings include the “Made in the USA Union” label. Meeps Vintage Fashionette, 2104 18th Street NW, http://www.meepsonu.com, 202-265-6546, Tues. through Sat. 12 p.m. to 7 p.m. Sun. 12 p.m. to 5 p.m.